This summer I received three releases from three guitarists, solo works all [except for the inclusion of one track of a guitar duo]. The guitarists are unlinked, to my knowledge, by any past collaboration. All three engage in disparate musical projects that bear little or no resemblance to their solo output. The releases come to me from Pozman [Poland], Barcelona, and London. Upon repeated listens to all three, practicing the colligating that makes writing about music pleasurable, I hear these three guitarists linked and simpatico in interesting ways. The guitarists, Jeff Gburek, Ferran Fages and Michael Rodgers, all imbue their solo projects with doses of melancholia and a strong sense of the crepuscular. That last quality is heard, most overtly, in Rodgers’ lovely Twilight, Birds, the inaugural release on Rodgers’ imprint Lost Lights. Rodgers’ new imprint [he was once the co-honcho of the TwoThousandAnd label] combines audio, visual and tactile elements in a way that makes Twilight, Birds literally a felt experience. 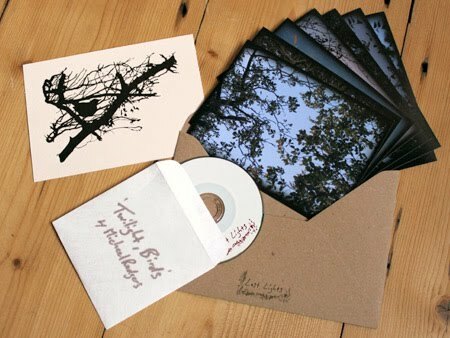 Rodgers assembled seven color photographs of trees at dusk, their branches filled with barely perceptible birds; a hand-stamped 3″ CD; a printed postcard and envelope; and a bare bones recording of guitar duende and birdsong, its extemporaneous and primitive melodies reminiscent of Rodgers’ similarly naked guitar poetry on his Black Petal release, Curtained Moon. The ink art on the cover of Rodgers’ work bears no little resemblance to that found on Gburek’s Impatience, released this summer on the Nothing Out There imprint. Gburek centers his guitar improvisations here around ideas and approaches seeded in John Fahey’s Charley Patton-raga solo guitar works, such as Fare Forward, Voyagers and Of Rivers and Religions. Between spirited finger-picking there is the pensive, darker hues heard in Rodgers’ twilight melodies. Ferran Fages’ Lullaby For Lali begins with a somewhat dolorous, blues-inflected melody as well, breaking into brighter skies only in its second section, a reiteration of Lali’s simple melody orchestrated for mallet instruments, acoustic guitar and a supportive, chugging bass line. Even as this sunny melody extends to Lali’s horizon, there is a very gradual subsuming of the song by distant, keening electric guitar feedback, as Lali‘s song disappears into the soft din. Fages and Rodgers share a concision in their releases reminiscent of the album-length works of Fahey. All three, pace Loren Connors, are developing the blues idiom, braided with other elements of their respective approaches. All three develop their ideas with insistent repetition and minimalist motifs. And all three, heard in the context of several decades now of table-top, disassembled and chopped guitars in improvised music, are engaging in a rapproachement with the conventional handling of the guitar, melodic/song-form improvisations, and working within fairly constricted and boundaried harmonic ideas. The guitar is off the table, and these three are returning to the primitive and naive traditions [please read this as intended-the sense of primitivism and naivitie suggested by anarcho-primitivism, heiroglyphs or musical nascence, not in a pejorative sense]- much of what was jettisoned, even by the guitarists at hand in other works, is returned to for further exploration. 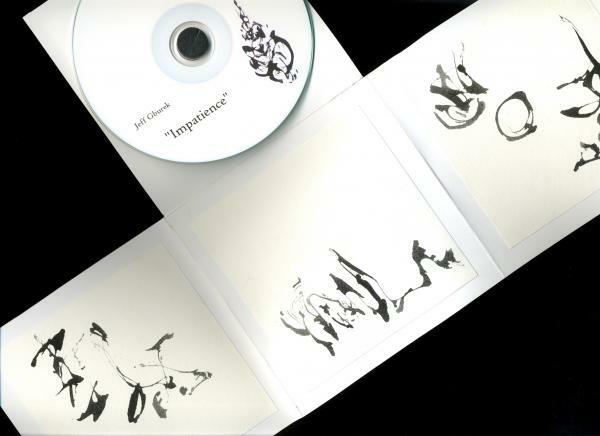 Gburek concludes Impatience with a duo with Tetuzi Akiyama I return to multiple times when spinning this fine release. Akiyama’s acoustic guitar is all pointillism and strikingly placed dark chords, strongly reminiscent of the guitar parts of Peter Maxwell Davies’ haunting Dark Angels. Gburek, in the releases’ sole inclusion of electric guitar, limns subtle slide guitar colorations in and around Akiyama’s sobering chord sequences, the result being a beautifully strange, carefully sculpted guitar duo that completely erases the privileging of composition or improvisation in this music. Fages, Gburek and Rodgers are shearsmen of sorts; they play a tune beyond us… of things exactly as they are. 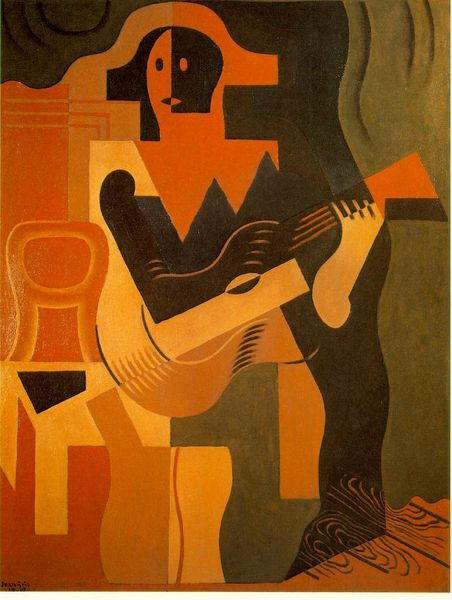 The images: Juan Gris, Harlequin With Guitar, Michael Rodgers’ Twilight, Birds, Jeff Gburek’s Impatience. This entry was posted in music writing on September 19, 2010 by jessewgoin.